Russell Brand's resignation and the suspension of Jonathan Ross were "out of proportion", the woman at the centre of the Radio 2 lewd calls row has said. Georgina Baillie, 23, told TV channel Five a world without Ross and Brand would be "a very, sad dull place". Last week, the dancer said she was "thrilled" by their BBC suspensions "because justice has been done". The BBC acted after the pair left lewd messages about Baillie on the voicemail of her grandfather, actor Andrew Sachs. During the calls to the 78-year-old Fawlty Towers actor, Ross swore and said Brand had slept with Sachs' granddaughter. Last week, before the BBC had acted over the messages, Baillie said Ross and Brand were "beyond contempt" and should "pay for what they've done with their jobs". And after their suspensions were announced, she said: "Me and my granddad are both really happy. "I'm glad it's all over with, as far as I'm concerned." But speaking to Five for a documentary about the affair, to be screened on Wednesday night, she said: "I was really angry when I said I wanted them both to be fired, but I think the suspension was good enough." She added; "I think it's way out of proportion what's happened and I don't hate either of them - I don't at all. "I think they're really talented comedians and I think a world without Jonathan Ross and Russell Brand would be a very sad, dull place." She said she thought Brand needed "to learn a few lessons about respecting women" and Ross should "maybe think before he speaks in the future". "I don't have any harder feeling than that," she added. She said she wanted to carry on performing with her dance troupe, the Satanic Sluts, and said that "all these modelling offers have come through". The whole affair had put "a lot of strain on our relationship as a family", she added. "I was really embarrassed because my grandparents aren't supposed to think of me as someone sexual, they're supposed to think of me as a nice girl." 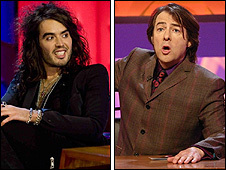 Brand resigned from his Saturday night radio show after both he and Ross were suspended from the BBC. Ross is now suspended without pay for three months. Radio 2 controller Lesley Douglas also resigned over the row. The offending programme, broadcast on Saturday 18 October, has prompted 42,000 complaints and is being investigated both by media regulator Ofcom and the BBC Trust.